Before the sun rises an army is on the move. They are men and women, young and old, armed with curved machetes and old oil jugs filled with water, bandanas to protect their face during the ensuing battle. They slip into the smoldering sugarcane fields in the darkness, to cut another day’s worth of cane. Within hours, soot and molasses will blacken their skin while they leave wakes of cut stalks behind them. They hack through the heat of the Central American sun. 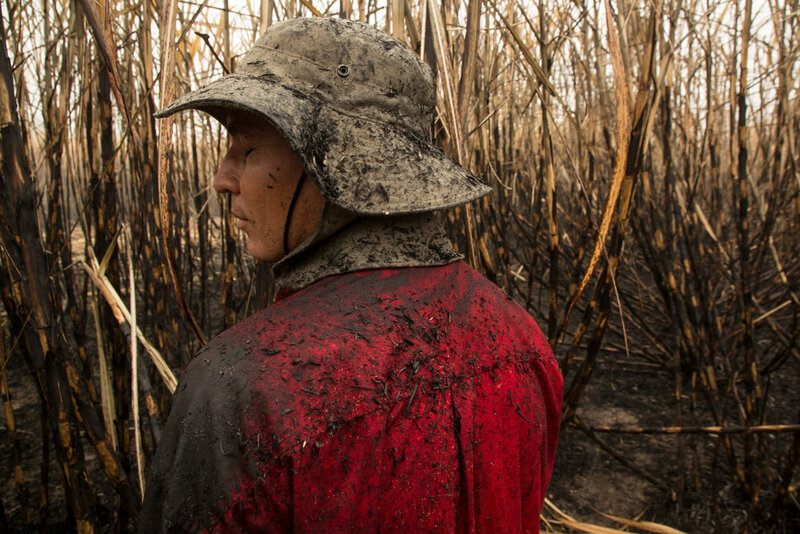 Sugarcane workers in El Salvador are a shadow of society. They are a vanishing reminder of the agricultural roots of a country embedded in the violent turmoil of an emerging economy. Over 10,000 sugarcane workers since the start of the millennium have died of an unknown form of kidney disease. Mechanization of the archaic industry is rapidly eliminating basic, manual labor jobs like cutting cane by hand. New job opportunities in factories and call centers offer more stable incomes and a respite from fieldwork. Many who don’t qualify migrate North. Others fall into gangs. But with only roughly 20% of El Salvador's sugarcane industry mechanized in 2016, thousands of men and women still earn their incomes supporting their families by cutting cane. For a job that has not changed much since it was introduced to the Americas some 500 years ago, the sugarcane industry is taking measures, whether it likes it or not, to protect the health of these remaining workers. A program focused on protecting the health of these workers is being carried out at El Angel sugar mill in El Salvador, led by public health and policy NGO La Isla Network by improving labor conditions and securing access to water, rest and shade. By modifying machetes, they have found a way to become more efficient and make the work less physically demanding. Results are preliminary, but rates of kidney disease development are estimated to have stabilized among participating workers while overall cutting efficiency increased by 30% or more. While the sugarcane industry throughout El Salvador continues to mechanize, much can still be done to improve the conditions and health of the workers. Meanwhile, these men and women toil to support their families, hidden in the fields, vanishing like shadows in the sun. A man drags cut sugarcane in the early morning at the La Carrera plantation near the Bay of Juiquilisco, El Salvador. A section of green cane that went unburnt the night before is torched to discard of the leaves while workers proceed to cut through the field in Los Almendros, Cuscatlan, El Salvador. A sugarcane cutter near Los Almendros, El Salvador covered in soot and charred cane one early morning. Celson Martinez, 40, of Los Almendros eats breakfast in a sugarcane field near Suchitoto, El Salvador. Jose freddy Paises, 20 of Los Almendros, Cuscatlan, El Salvador starts the day cutting cane during the WE program where he uses a new machete. He says he can cut up to 18 tons of sugarcane a day compared to only 10 with the old model. He earns $2.26 per ton cut. Miguel Abrego Rivera, 32, of Los Almendros, Cuscatlan, El Salvador cuts cane with a new machete as part of the WE Program. He says he can typically cut 10 tons a day with the new one, but today only 5 due to bad conditions of the sugarcane. He finished his studies in accounting but gave up working in the city because he prefers working in the country in agriculture. Father and son, Nelson, 36, and Javier, 18, Garcia of Masatepeque cut sugarcane together. Nelson, who lived and worked as a painter in Utah for 3 years, worries about the security situation deteriorating in his community. As the drought worsens, and the sugarcane doesn't grow much, families slip deeper into poverty, making people, especially young men, desperate to provide for their families, often times turning to crime. This is Javier's first year cutting sugarcane. Maria Martinez, 40, of La Carrera, Juiquilisco, El Salvador, collects the leftover scraps of sugarcane that machines could not pick up and puts them into piles which are later collected and transported to the mill. She used to work in the plantain operations and she has a 12 year old daughter sick with Chronic Kidney Disease of unknown causes who receives treatment at a local hospital. Kevin Alfonso Alas Enriquez, 24, of San Jose Guayabal, used to work cutting sugarcane but now works as part of a team that carries shade tents and water into a sugarcane field outside of Apopa, El Salvador. Workers participating in the accelerometer study take a break under the shade canopies provided as part of the WE Program in a sugarcane field outside of Los Almendros, Cuscatlan, El Salvador. Pedro Hernandez, 61, of Los Almendros cuts 3 to 4 tons of sugarcane a day and has been cutting for 10 years. He is pictured taking a rest in the shade of a clump of sugarcane, which before the WE program introduced shade tents, was virtually the only way to create shade in large fields. This days was 99 degrees fahrenhiet. Adolfo Antonio Paises Hernandez, 20, of Los Almendros, Cuscatlan, El Salvador cuts cane while particpating in an accelerometer study. During the week of February 22-28 researchers working with the WE Program used state of the art accelerometers to measure the difference in work load between the two machetes used by sugarcane cutters in the program. All photographs copyright Tom Laffay. Any use requires explicit authorization. Thank you.